I wear way too much pink to be considered a fan of gothic style in my home or clothing. 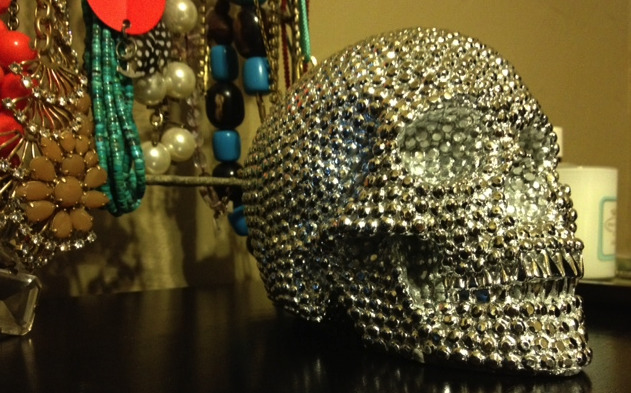 But, I do LOVE skulls. Lola has a pink and white skull collar and leash, I have a skull scarf and I am currently working on yellow skull adorned friendship bracelets! So, when I saw this on Instagram and then online I *had* to have it. I am redecorating my room (just adding a new accent color, orange! 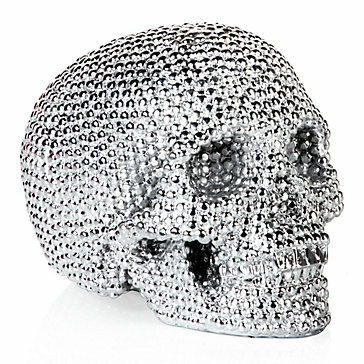 ), so I think it will make a perfect addition sitting next to some of my favorite necklaces and perfumes. It almost looks like crystals covering the skull but it is metal made to look like it.